Creating relations diagram with free templates and examples. Relations diagram has never been easier. The relationship matrix, also called matrix or matrix chart, is a convenient method of visualizing relationships quickly and definitively. The relationship matrix not only shows the relationship between two, three or four groups of information but also gives information about the relationship, such as its strength, the roles played by various individuals or measurements. Besides, it also enables you to create, modify and delete relationships between elements with a single mouse click which is another quick way to set up complex sets of element relationships with a minimum of effort. There are six differently shaped matrices are possible: L, T, Y, X, C and roof-shaped, depending on how many groups must be compared. 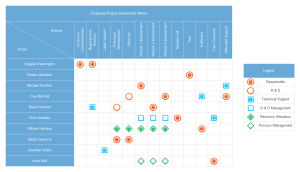 A relationship matrix diagram is commonly used to analyze relationships with clients, suppliers, service providers, stakeholders and staff. 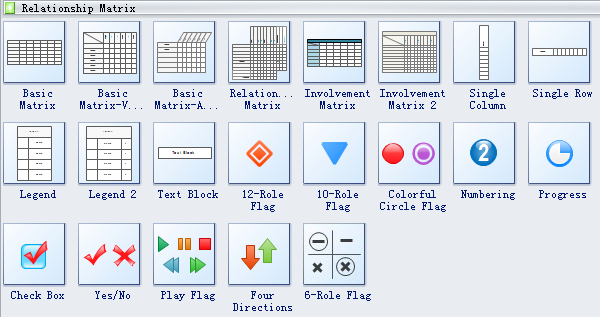 Edraw offers an easy way for creating relationship matrix graphs. It's simple to use yet powerful in features. It has a large collection of corresponding shapes and examples, allowing you to drag and drop any shape you want. You can format your drawing through colors, fonts, sizes, and lines setting. 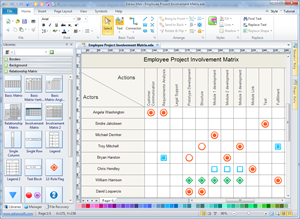 A relationship matrix example created by relationship matrix software that you can use as a template to assist your relationship matrix designs.